MAPUTO, Jul 11 2012 (IPS) - Every Wednesday at 11.00am José Alfredo Cossa unfurls his East German flag and leads a march of around 150 men and women down the main streets of Maputo, Mozambique’s capital. 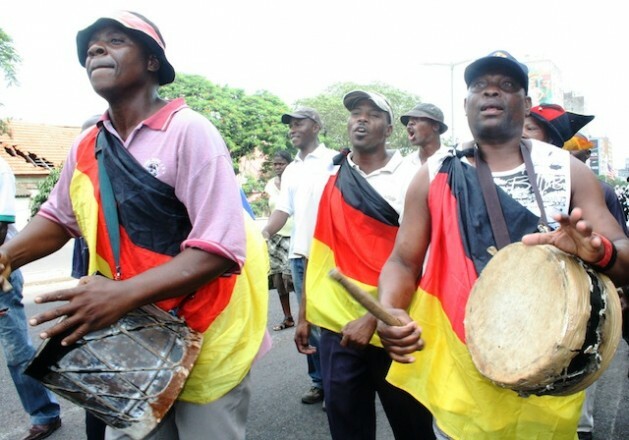 In a struggle for justice that has been going on for more than 20 years this group, known as the “Magermans”, represent the 16,000 to 20,000 Mozambicans who were sent to the former East Germany in the early 1980s to work and serve their country. “We’ve been marching for 22 years to get the salary we earned in Germany. We keep coming because we are sure that one day they will pay,” explained Cossa. “In Europe we learnt about peaceful protest. Where else in Africa would you see a demonstration like this?” he asked. Magermans is a local name meaning those who came from Germany. Passersby turn to stare as the procession passes. Blowing whistles, beating drums, singing and dancing the carnival atmosphere of this demonstration belies the ongoing struggle behind it. When Mozambique gained independence in 1975 hundreds of thousands of skilled Portuguese workers left almost overnight, which had a devastating effect on the country’s economy. So in 1979 President Samora Machel’s new left-wing government made an agreement with socialist East Germany to send Mozambican men and a number of women there to study, train as apprentices and work in the former German Democratic Republic or GDR’s state-run enterprises, the Volkseigener Betriebe, with the aim to return with new skills to help build their country. “I was sent to learn carpentry when I was 21 and then got a work contract for four years. Others were employed to cut trees, work in abattoirs or in the coal industry,” said Cossa. The workers received 40 percent of their salaries in cash while the other 60 percent was sent back to Mozambique. “We were told that on our return there would be a bank account waiting for each of us,” said Magalhães. They worked until the end of the decade when tensions within East Germany increased culminating in the fall of the Berlin Wall in 1989. “We were happy when the barriers came down but were afraid of the skinheads and neo-Nazis who didn’t like foreigners and we worried what would happen if we no longer had government protection,” said Magalhães. Many chose to go home but the decision was not an easy one. “Some of the wives and children came to the airport. The women were crying and begging their husbands not to go,” recalled Magalhães. Yet those heading back believed it was the start of a prosperous new future. “We had great expectations. I was planning to start my own carpentry business making windows, doors and furniture and then bring my girlfriend from Germany. But when we got here the money was gone. The government had eaten it all and my hopes fell to the bottom of the sea,” said Cossa. While the German government has records showing that the money was sent it appears the individual accounts were never set up by the government in Mozambique. The Magermans also found it difficult to adjust to life back home. “Our neighbours wore ragged clothes and we arrived dressed as gentleman. There were no televisions or videos in Mozambique. We brought them,” said Cossa. Some of the workers did find jobs with one Magerman opening a string of successful bakeries across Maputo. Yet as the months passed the majority found themselves without work or money and within a year of their return they began to protest outside the Ministry of Labour. “We were just asking for what was rightfully ours but the government sent armed police to deal with us,” recalled Magalhães. The protests have continued to this day with their case passing from one Ministry to another without resolution. In 2002 official enquiries were made with the German authorities to see if there was a case to answer. A document, in possession of the Magermans, released by the German Federal Ministry of Finance, shows that 74.4-million dollars in salaries and 18.6-million dollars in social security were paid by the former GDR, figures which equate to approximately 5,000 dollars per worker. The Mozambican government accepted that a much smaller amount was owed and began to make payments of 10,000 t0 15,000 Meticais (or between 370 to 550 dollars) to some of the workers. Over the years many of the men lost contact with the families they left behind. Now in their late twenties, some of the children have come to Mozambique looking for their fathers. ICMA is one of the places they contact first. “We get emails from families almost every day. One girl came and found her father living in a hut made of mud bricks and palm leaves. She stayed there for a while and then took him back to Germany,” said Magalhães. Cossa explained that the next step for the Magermans is a meeting with Prime Minister Aires Ali.